According to Hindu Mythology, Lord Vishnu plays the role of the preserver of the Universe. He is also a member of the Hindu Trinity, the others being Lord Brahma and Lord Shiva. 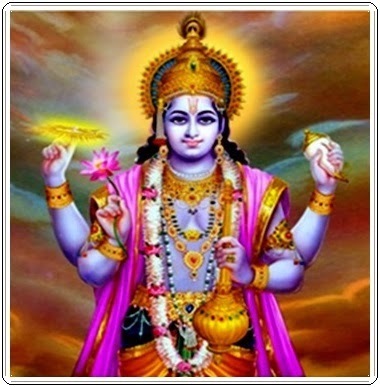 According to Vishnu Sahasranamam Vishnu is considered as the supreme god and worshiped with great reverence. In order to protect and preserve the World Vishnu manifested to the world in a variety of forms, called Avatars. According to the Bhagavad gita, whenever evil gains ascendance, God incarnates on earth to restore dharma, punish the evil and protect the weak and the righteous. Vishnu Mantra forms the part of prayers offered to the lord. Given below are some of the mantras of Lord Vishnu. "Om Namo Narayanaya" "Shaantaakaram Bhujagashayanam Padmanaabham Suresham Vishwaadharam Gaganasadrasham Meghavarnam Shubhaangam Lakshikaantham Kamalanayanam Yogibhir Dhyaanagamyam Vande Vishnum Bhavabhayaharam Sarvalokaikanaatham."